You are lucky, I thought, damping down my jealousy. My son hates to read. He loathes it with a passion unseen since he lost a game of Candy Land to me when he was three years old. I can’t exactly post “My son hates reading!” on social media, though. He’s a teenager now and I’ve waited years to admit publicly how much he hates it. 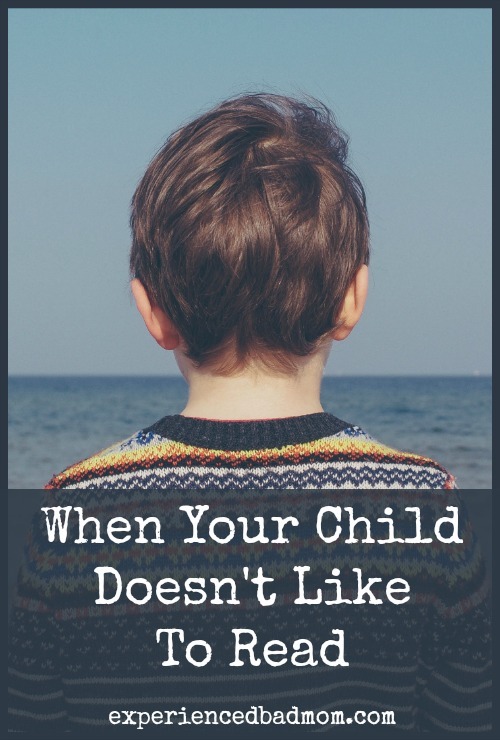 I felt that my son’s lack of interest in reading meant that I was a bad mother, that I had failed somehow. I read in front of him. I love to read. I read to him. Daily from birth until third grade. I took him to the library. I took him to story time at the library. I signed him up for the summer reading program at the library. I took him to the bookstore. I bought him books from the bookstore. I bought him books from the school book fairs. I made sure his daycare was a developmentally-appropriate, NAEYC-accredited child care center that was chock full of book nooks, story times, and language-enrichment activities. I signed those homework reading logs that came home every night from kindergarten through sixth grade. I chatted with him about books. I bought him a Kindle. I downloaded books for his Kindle. Did I mention I read in front of him? I love to read! For years, I’ve felt bad about his lack of fervor for reading, especially during the dreaded “March is Reading month”. Until one day I stopped. Maybe I should put that on social media. He can’t be embarrassed by such a post. Chances are he won’t even read it. Copyright 2016 Katy M. Clark as first published on Sammiches and Psych Meds. Yet another case for the fast forward button. We spend so much time worrying about our kids. Imagine if we could zap into the future and see that all will be well. Wow!! Sure would haves saved me some sleepless nights, I can tell you. My son is a reader and my daughter is not. Like you, I stressed over it. Same genes, both parents love reading etc. Then I thought of my sister. She never read and has done extremely well. Reads now on her own terms. You’ve reminded me also of the important need to chat with other moms. So key to not fuss and stew in a bubble. Share your worries and you’re bound to find your people. Yes to sharing! I would also add how invaluable it is to make friends with moms of older kids (hint, hint) who can tell you gently and wisely that everything is going to be okay. I was nodding throughout this because neither or my kids enjoy reading. It’s bizarre, because they’ve seen me with a book their entire lives. I read to them. I bought them SO many books. It is beyond frustrating. However, my son is really good at computer stuff. He has his own YouTube channel. Self taught. My daughter…well, she’s just loud. But creative. It is so bizarre and frustrating, I get it. My son is just…my son. He doesn’t like to read, I love to read. I’m glad you gave up that silly thought of being a bad mom. I know in my heart it was okay that he didn’t like to read, but there does seem to be pressure out there to make ALL kids into book lovers. Kinda like swimming! There’s a lot of pressure to make sure your kid is a fish. Thanks for your kind comment. “Chances are he won’t even read it”. LOL you smart a$$. Uhhh, danced in my basement and watched Harry Potter”. This post gives me comfort for not being the reading type. However I absolutely love reading Dr.Seuss books to children. Uhhh, I danced in my basement and watched Harry Potter – LOVE it! I’m glad I wrote this post because there are many lovely folks who have come forward and said either it relates to them or their kids. Most people can read, but not everyone has to love it. I love this post! Now I can’t say that my son hates to read because he is only 5.. but I do feel the same way as you do. He hates writing. I try to sit down with him to do his homework.. no luck. He cries and sometimes even has a tantrum. I love to see posts like this. Thank you so much for posting with #happynowlinkup ! Oh, I’m glad it helped! And I’m glad your 10yo daughter is feeling good, too. She should! My son is now 15 and has a 3.9 GPA and NEVER reads for pleasure, lol.